ABOVE: The view from the top-tier Engelsloge or "Angels' Loge" next to the proscenium, where late-arriving guests watch Bayerischer Staatsoper performances until they're allowed to take their seats at intermission. To purchase tickets for Bayerische Staatsoper performances online, use the English-language Tickets form at the opera company's Web site. Online ticket sales are available for performances during the next two months; beyond that, you'll need to book ahead by letter, fax, or e-mail, and your order will be processed two months before the performance date. For more information, see the Bayerische Staatsoper's Advance Booking page, which also has an address, phone numbers, and hours of operation for the box office in Munich. The free encyclopedia has a history of the opera, a synopsis, and a handful of external links. 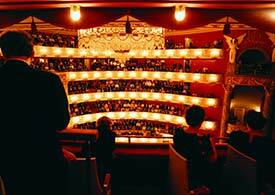 Finally, see our articles on the Bavarian State Opera and guided tours of the Nationaltheater.